Philippine President Rodrigo Duterte delivered his State of the Nation address July 23 at the House of Representatives in Manila. Religious leaders and activists say human rights are dying under Duterte’s rule. 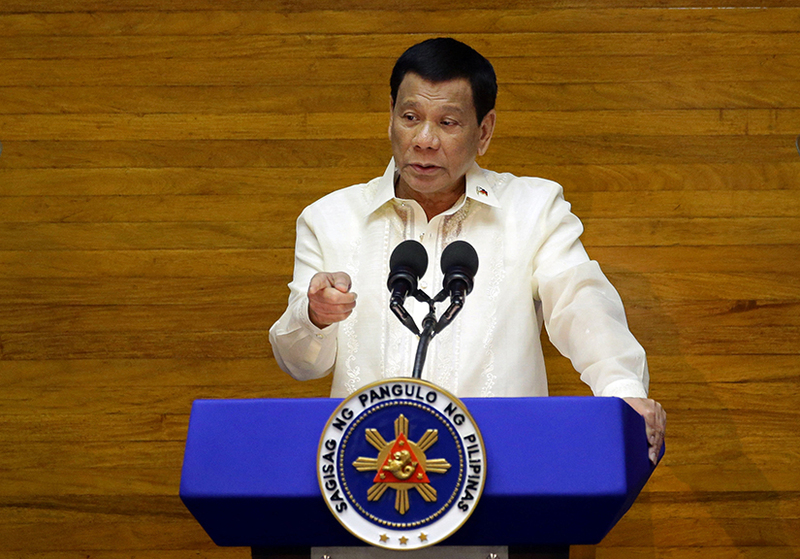 MANILIA, Philippines — Philippine President Rodrigo Duterte warned the public during his third State of the Nation address July 23 that his two-year war on drugs would become even “more chilling” in the coming days. During the Mass, the bishop who delivered the homily reminded parishioners that about 23,000 people have been slain as part of Duterte’s brutal campaign against narcotics pushers and users, ucanews.com reported. Some didn’t need reminding; they already had lost family members to what critics view as a campaign of state-sanctioned murder, with many suspects gunned down before being able to defend themselves in court. Cristina Palabay, one of the group’s members, said the body count from drug-related killings at the hands of security forces already has surpassed the number of deaths recorded during the martial law years of late dictator Ferdinand Marcos. On July 16, at least 1,600 tribal people from 15 communities in the towns of Lianga and San Agustin in the southern Philippines fled their homes because of military operations, the rights group Karaptan stated. One of the hardest hit areas is Mindanao, where martial law was declared at the onset of a five-month armed conflict in the city of Marawi that began on May 23, 2017, the rights group stated.